TEHRAN, Iran (AP) — His image is on bank notes and in school textbooks in Iran, often as a black-and-white embodiment of the 1979 Islamic Revolution that swept aside the country's shah and forever changed the nation. Forty years ago, Iran's exiled Ayatollah Ruhollah Khomeini descended from a chartered Air France Boeing 747 to return to Tehran, a city on the cusp of revolution. TEHRAN, Iran (AP) — Iranian semi-official Fars news agency is reporting that the country's authorities have detained 27 suspected members of a terrorist group. The Monday report says the group planned to commit "terrorist activities" last week in Tehran and some major cities in the country. It also said they had threatened individuals with death. TEHRAN, Iran (AP) — Iran has sentenced eight people to death over attacks claimed by the Islamic State group last year. Mousa Ghazanfarabadi, the head of the Tehran Revolutionary Courts, told state TV Sunday that they were found guilty of aiding the five militants who attacked parliament and a shrine to Iran's revolutionary leader, Ayatollah Ruhollah Khomeini. The attacks last June killed 18 people and wounded more than 50. Security forces killed all the attackers. TEHRAN, Iran (AP) — An Iranian media outlet is reporting that the trial of alleged members of the Islamic State group who took part in an attack in Tehran in 2017 has begun in the country's Revolutionary Court. The report from the judiciary news website Mizanonline.com says the case involves 26 defendants and eight attended the first hearing Saturday with their lawyers. Charges include being members of a terrorist organization, weapons possession and unauthorized entry into the country. TEHRAN, Iran (AP) — Iranian President Hassan Rouhani says the people of Iran will continue supporting the Islamic Republic despite foreign pressure. His comments came Wednesday, just hours after President Donald Trump said the U.S. stands with the people of Iran against the country's ruling establishment. Rouhani spoke during a visit to the mausoleum of the Ayatollah Ruhollah Khomeini, the founder of the Islamic Republic. TEHRAN, Iran (AP) — An Iranian news outlet is reporting that authorities have arrested a leader of the Islamic State extremist group. The Wednesday report from semi-official YJC.ir says the suspect was in contact with 300 IS members and was planning attacks during Shiite ceremonies across the country next month. TEHRAN, Iran (AP) — Hundreds of Iranians attended the funeral Thursday of Ebrahim Yazdi, one of the country's most influential dissident politicians and a former foreign minister. Yazdi was a close ally of Ayatollah Ruhollah Khomeini, the late leader of the 1979 Islamic Revolution, but he opposed the takeover of the U.S. Embassy and his party later broke with the clerics as they consolidated power. TEHRAN, Iran (AP) — Iran's official IRNA news agency says one of the country's most influential dissident politicians who once served as foreign minister, Ebrahim Yazdi, has died. He was 85. Monday's report says Yazdi died in Izmir, Turkey, due to complications from cancer. He was a close ally of Ayatollah Ruhollah Khomeini, the late leader of the 1979 Islamic Revolution. TEHRAN, Iran (AP) — Iran's official IRNA news agency is reporting that police have killed four Islamic State group-linked gunmen in the country's south. The Monday report quotes the chief of police of Hormozgan province, Gen. Azizollah Maleki, as saying his forces killed the gunmen Sunday in a shootout near the town of Roudan, 1,200 kilometers (745 miles) southeast of Tehran. TEHRAN, Iran (AP) — Iranian authorities have arrested eight suspects for allegedly supporting the Islamic State-claimed attacks on Iran's parliament and the shrine of Ayatollah Ruhollah Khomeini that killed 17 people in Tehran, the state-run IRNA news agency reported Saturday. 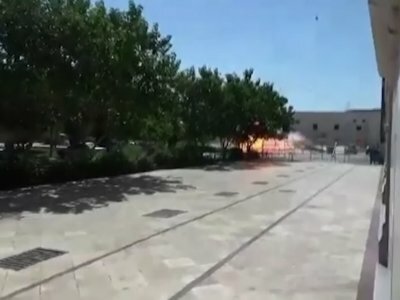 WASHINGTON (AP) — President Donald Trump is suggesting that Iran shares some blame for twin attacks by extremists on its parliament and a shrine, and insisting that sponsors of terrorism "risk falling victim to the evil they promote." Australia's foreign minister has condemned two attacks Iran's parliament and the tomb of its revolutionary leader, Ayatollah Ruhollah Khomeini, in Tehran which killed at least 12 people and wounded more than 40. The Islamic State group claimed responsibility. WASHINGTON (AP) — President Donald Trump on Wednesday offered solace to the victims of the twin terrorist attacks in Iran while suggesting Tehran bears some culpability, saying "states that sponsor terrorism risk falling victim to the evil they promote." TEHRAN, Iran (AP) — The Islamic State group claimed responsibility Wednesday for a pair of stunning attacks on Iran's parliament and the tomb of its revolutionary leader, Ayatollah Ruhollah Khomeini, which killed at least 12 people and wounded more than 40. ANKARA, Turkey (AP) — Iranian Foreign Minister Mohammad Javad Zarif arrived in Turkey on Wednesday, saying there was a need for close discussions with Turkish officials on "worrying" developments in the region. DUBAI, United Arab Emirates (AP) — As Iran's chief nuclear envoy, Hassan Rouhani earned the nickname "diplomat sheikh" when negotiators in 2004 reached a deal that saw the Islamic Republic halt all its enrichment of uranium. Over 10 years later, it would be Rouhani as president who would strike a bargain with world powers to again limit Iran's atomic program, showing once more the cleric's pragmatism in slowly engaging with the West. TEHRAN, Iran (AP) — Hundreds of thousands mourned former Iranian President Akbar Hashemi Rafsanjani on Tuesday, wailing in grief as his body was interred at a Tehran shrine alongside the leader of the country's 1979 Islamic Revolution. TEHRAN, Iran (AP) — Iran's former President Akbar Hashemi Rafsanjani died Sunday after a decades-long career in the ruling elite, where his moderate views were not always welcome but his cunning guided him through revolution, war and the country's turbulent politics. DUBAI, United Arab Emirates (AP) — The scratchy, echo-filled tape recording carries the voice of a man who once was in line to become Iran's supreme leader, talking about one of the darkest moments of the country's post-revolution history still not recognized by its government.